We spent most of our time on the south part of Kakadu. However, on the last day we decoded to do a 90 km detour for stunning views and short interesting walks. One of them was along Stone country which is some of the oldest rock in the world and the house for Aboriginal Australians for thousands of years. Stone country signals the start of Arnhem land a vast area of the top end named after a Dutch boat that passed a hundred years before Captain Cook arrived. This particular site in Stone country is called Gunwarrdehwarrde; warrde means ‘rocks’ and gun ‘lots of’. 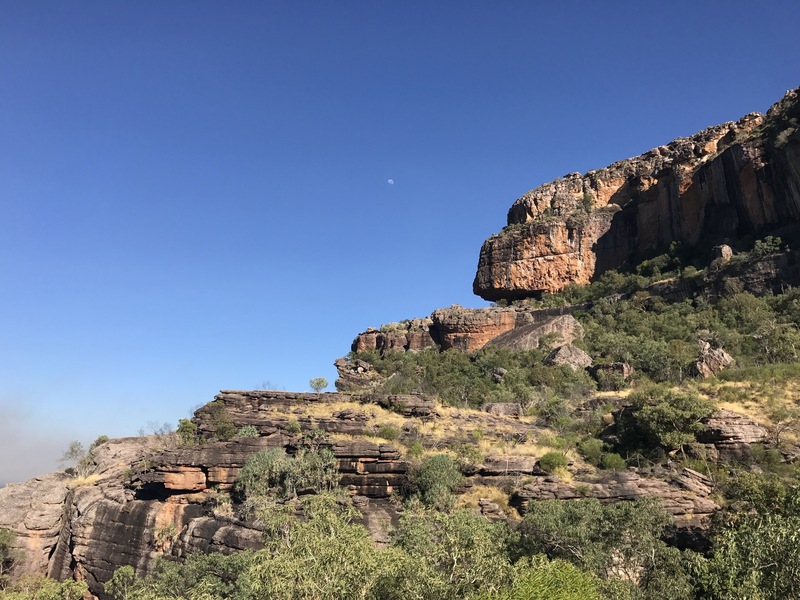 In the walk we learnt that during wet season, Stone country was the home of the inhabitants of Kakadu. We also learnt about the aboriginal art which are paintings some of which cannot be dated; the ink is made of stone (ochre) which cannot be carbon dated. Those that can be dated are due to one of two reasons: either the paint was made of bees wax and thus can be carbon dated, or the ancestors painted over wasps nests and those nests can also be carbon nested.